With Christmas and New Year fast approaching healthy habits on our minds as we try and slim now in time for all the festivities. Although remaining healthy is hard as many of us are beginning to trade glasses of water for jugs of beer. 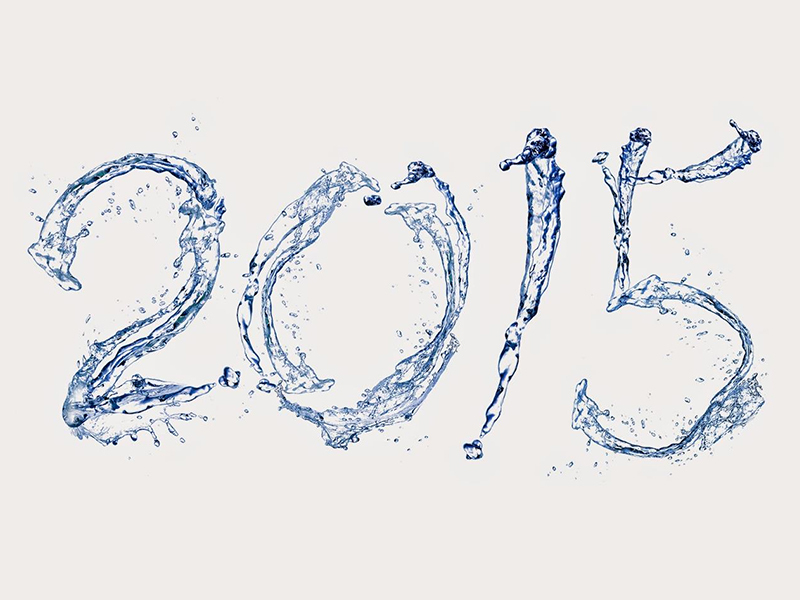 While we may not be able to stop you over Christmas, why not make a New Year’s resolution to drink more water! Not only will this help you get over your January 1st hangover but also give you a kick start to a healthier 2015. We’ve uncovered some convincing 12 unexpected, yet convincing reasons to knock back more water in the New Year. Roughly 60 % of the body is made of water. Drinking enough H2O maintains the body’s fluid balance, which helps transport nutrients in the body, regulate body temperature, digest food, and more. Sweating at the gym causes muscles to lose water. And when the muscles don’t have enough water, they get tired . So for extra energy, try drinking water to push through that final set of squats. Certain toxins in the body can cause the skin to inflame, which results in clogged pores and acne . While science saying water makes the skin wrinkle free is contradictory, waterdoes flush out these toxins and can reduce the risk of pimples. Our kidneys process 200 quarts of blood daily, sifting out waste and transporting urine to the bladder. Yet, kidneys need enough fluids to clear away what we don’t need in the body. Let’s drink to that! In order to really focus, a glass of water could help people concentrate and stay refreshed and alert. If booze has got the best of you, help a hangover with a glass of water to hydrate the body and stop that pounding headache. A little water can really go a long way. Aching joints and muscle cramps and strains can all occur if the body is dehydrated . Nobody wants to deal with digestion issues. Luckily, drinking enough wateradds fluids to the colon which helps make things, ahem, move smoothly. Water may help with decongestion and dehydration, helping the body bounce back when feeling under the weather. Just beware—drinking fluids hasn’t been scientifically proven to beat colds in one swoop, so don’t swap this for a trip to the doctor or other cold remedies. A study in London found a link between students bringing water into an exam room and better grades, suggesting water promotes clearer thinking. While it’s unclear if drinking the water had anything to do with a better score, it doesn’t hurt to try it out! The amount of water people need per day is up for debate, but studies suggest adults need nine to 16 cups of H2O daily. However, this number varies depending on activity level, age, and how much water people are consuming in coffee, tea, or water-rich veggies and fruit. Here’s how to keep yourself hydrated: Begin by drinking a glass of natural spring water as soon as you wake up, and 30 minutes before eating any big meal, this will help control appetite too. A great way to make sure that you’ve got water on hand at all times is to introduce a water cooler into your home or office. Aussie Natural’s water coolers start from just $9/month and can be delivered free to you anywhere in Metro Perth. Our water coolers allow you to have instant access to cold, chilled or hot water, making it easier than ever to keep up your hydration levels. Also get in the habit of keeping bottled water on hand at all times. And if the taste beings to bore, spice up the taste buds with a squeeze of citrus to the glass! Before you know it, all the health benefits of water will be right at your fingertips…. and in your body!